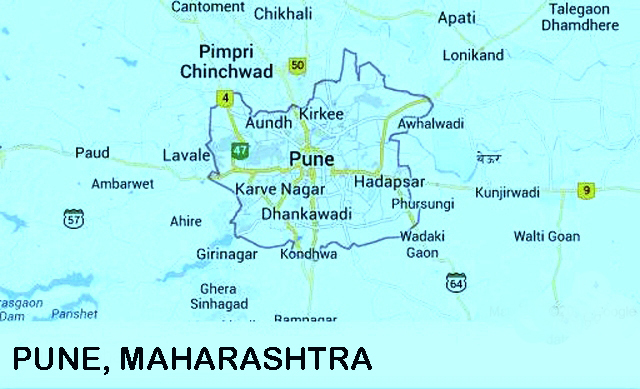 Pune, 154 Kilometers by Express Way from Mumbai, was the capital of Peshwa administration (1749-1818). A welcome relief from the humidity of the coast, the weather is fine in this city of 5 million inhabitants on the Mutha and Mula rivers. In East Kirkee is the Aga Khan’s Palace (he has many Muslim followers-the Khoja sect-here and in Mumbai) and the neo-Gothic Deccan College (formerly Sanskrit College), a leading center of Oriental culture in Western India. The Mutha flooded badly in the monsoon of 1961 after the collapse of its dams. The old city proper is on either side of this river before it is joined by the Mula. Ganeshkhind suburb, containing the old Government House-seat of Pune University since 1948-is on the left. The Engineering College , now part of the university, was one of the few such establishments of pre-Independence days; most of India’s engineers were trained there. On the opposite bank is the Shaniwarwada section where stand the gates and guard house of the Peshwa Palace. Here you see the vestiges of 18th century warfare; the gates are fortified with spikes against elephant charges. Elephants were also used outside the palace for trampling to death high-ranking offenders of the latter-day Peshwa regime. Pune is the headquarters of the Army’s Southern Command. The area east of Shaniwarwada is the cantonment, which is owned and administrated by the Defense Department of the Central Government. In this part of town are several schools, swimming pools, and a large residential district well laid out on shady streets. The Empress Gardens’ tropical trees and plants provide cool strolls even on the hottest days of the year. 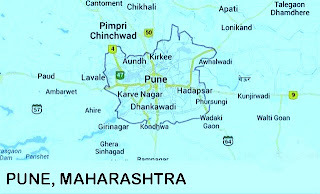 Pune was the childhood home of the Maratha King Shivaji He was born in 1627 at Shivneri, north of Pune, in a bleak fortress tower. His father-a soldier of fortune-had gone on to a second wife and Jijabai was left to bring up her son alone. He roamed the many hills round about Pune and studied the history and customs of the people he would one day galvanize into organized action. A fine equestrian statue, built largely through the munificence of the Maharajah of Kolhapur, one of Shivaji’s descendants , stands in the heart of the city, not far from Panchaleshwar Temple. On the south edge of town is Parvati temple, a white building prominent on a hilltop among smaller shrines. Easily climbed stairs led up to it. From here you can view the Valley stretching to the first of the four ghats to be crossed on the way to Mahabaleshwar. It is said that after the defeat of the Marathas by Ahmed Shah Durrani at Panipat (1761), Balaji Bajirao was so heartbroken that he retired to Parvati Hill and died there. Nonetheless, Pune recovered much of its former glory under Nana Peshwa in the latter part of the century. The saying Jab Tak Nana, Tab Tak Poona (as long as Nana lives, Pune will live) expressed its faith in him. But the last year of the Empire was filled with strife and in 1817, Pune finally fell to the British at the Battle of Kirkee (Khadki). Under them, the city developed into the “monsoon capital” of Mumbai Province and also became a large military center. Pune is proud of its role of the great names associated with India’s emancipation. Among them are Lokmanya Tilak, who devoted his whole life to the struggle for freedom; G.K. Gokhale, who founded the Servants of India Society which has built up a tradition of dedicated public service; and Professor Karve, who started out with a small home for widows in a village, and has built up a network of schools and colleges, including the Indian Women’s University. Just eleven miles away, at Khadakvasla, is the modern National Defense Academy, where cadets of all the services are trained in up-to-date warfare. Four miles beyond Khadakvasla, away from the lake, is Sinhgad (Lion Fort) named after the lion of the officer Tanaji, who died capturing it in 1670. It was on a whim of Jijabai, always close to Shivaji and inspiring him, that the next to impossible attempt was made. Tanaji and 300 men, including his 80-year-old uncle, climbed 1000 feet on foot, and the next 1000 on ropes held by trained giant lizards (Ghorpads) on the perpendicular side of the fort. The Moghul garrison was watching some dancing girls and the surprise attack nearly succeeded when Tanaji was killed. The assault was nearly a failure until his brother appeared by another route and the black “no-moon” night was broken by a victory bonfire lit to signal Shivaji at Raigad Fort. There are the tombs of Tanaji, of Rajaram, Shivaji’s second son, the defeated Muslim commander of the fort, and a marked place where Tanaji’s left arm, cut off in a battle, was buried. From here you see Raigad, Shivaji’s Capital, where he was crowned, and where he died. His throne and Samadhi (burial urn) is to be seen in this fort dating from 14th century Vijaynagar Empire glory. Purandhar, still used as a vacation center, is another hill fort some 23 miles southeast of Pune. A treaty was signed here in 1776 between Peshwas and Governor Hasting’s envoy, a hardy British tourist who trekked across Central India from Calcutta and back!